NEW Second Edition – updated for the Winter 19 release! This eBook focuses on how to migrate your company from the Salesforce Classic User Interface (UI) to the new Lightning Experience (LEX). Salesforce declared 2016 "The Year of Lightning," and not surprising, that’s been the focus of their recent product innovation (read: "Classic is dead"). With each new release Lightning gets better and better, and for many, the feature gap to Classic is becoming a non-issue. "Much of the value of your user licenses are tied to the new features Salesforce delivers three times a year. If you remain on Classic, you’ll be paying for annual updates but unable to reap the rewards." Is now the time to make the jump to Lightning? If you are an existing Salesforce customer using the traditional Classic Interface, and you’re contemplating making the switch to Lightning, then this eBook is for you! 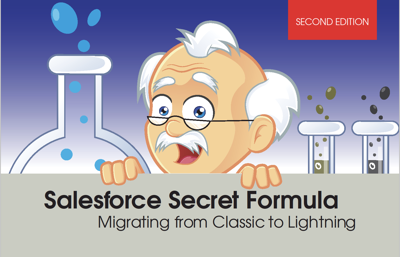 We discuss in-depth what it takes to have a successful Lightning Migration by providing you with our secret formula. Complete the form to receive your free copy and you’ll soon be on your way to a successful migration!